The concept and mission behind Zeenie Dollz started with a sketch. It was a mother and daughter team that brought it to life. Hansini, the creator, designer and inventor of the cute face dolls series, showed her mother, Laxmi, a beautiful sketch of a girl doll toy with flowing blue hair and explained that her persona was that of Mother Earth. With overwhelming support and belief in the concept, Laxmi used her toy industry experience to bring Zennia, the first unique doll in the series, to life. From there, the duo have worked together intimately through every step of the creative process to take a beautiful sketch, with a meaningful cause and a passion for the environment, and merge that into the Zeenie Dollz series you see today. Sini is the protector of all farm and domestic animals along with her pet dog Misty; together they provide all abandoned animals with food and safe shelter. Sini herself is made of recyclable materials and comes with a fashionable brush to style her hair, a luggage tag, a colorful bracelet, her pet dog Misty and the doll stand is included as well. This doll is perfect for my daughter, Lilyana. She loves animals and wants to be a veterinarian! My favorite thing about Zeenie Dollz is each doll possesses a secret identity and unique eco-power to save and protect the environment. Also, a percentage of every sale will be donated to organizations working to preserve the environment and protect all animals and the places they call home! Each 12" fully articulated ball jointed doll is made of recyclable and non-toxic plastics. How magnificent is that?! 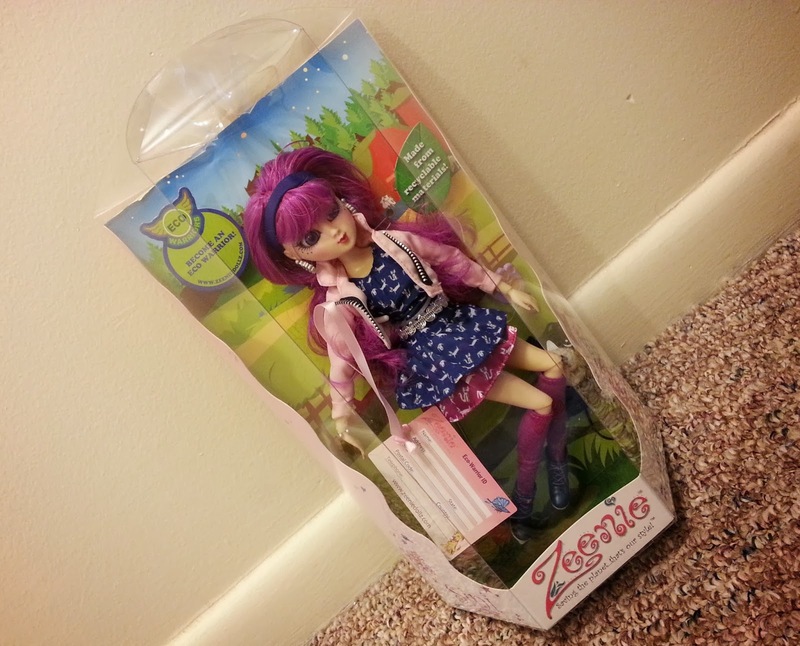 Zeenie Dollz will make the perfect Christmas gift for any little girl! This is a really cute doll and I love the story behind it. I love it, the hair is great. I like they that are made with recycled materials. She doesn't look trashy eaither, like a BRATZ doll. Playful and green! win, win! My six year old would love this.